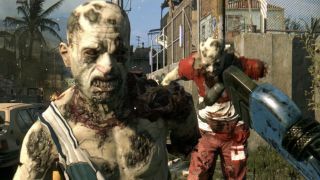 Dying Light came out today and our reviewer is currently eyebrow deep in cadavers while he puts the game through its paces. We'll have his verdict later this week, but in the meantime we fed Dying Light to the unfeeling computerised behemoth that is the Large Pixel Collider, set the graphics settings to "Best Quality," and recorded all the gory goodness at 1440p. Watch the video above to see the results, and be sure to check back soon for the final score. Want to see more from the LPC archive? Check out some of our other recent videos: Far Cry 4, Middle-earth: Shadow of Morder, Fifa 15, Ryse: Son Of Rome, Metro 2033 Redux, Deus Ex, Watch Dogs, Wolfenstein: The New Order, and Arma 3. There's a lot more where that came from. Have a game in mind you'd like to see the LPC take on at ultra settings? Tell the LPC directly on Twitter.